Over time, many of the connections between the objects in the NMAI and our archival records have been lost. This painted skin from British Columbia was one such broken connection. The background information of its acquisition was sparse, consisting only of a catalogue card. But thanks to a surprising discovery on the other side of the world, we now have more insight into the history of this object and so many others. We have been working since 2010 to match our collections with scattered archival records and reconstruct the provenance, or record of ownership, of objects. We call it the Retro-Accession Lot Project. We started with our own resources in the NMAI Archive Center, the Museum of the American Indian– Heye Foundation Records, but the search has spread to other institutions in the United States, and now to one halfway around the world in New Zealand. Early in the project it became evident that the history of the Museum of the American Indian (MAI), NMAI’s predecessor, was intertwined with that of other organizations. The world of collecting Native objects in the 20th century was relatively small. Many anthropologists and archaeologists worked for multiple institutions during the course of their lives, so their papers were often spread among several locations. Objects for sale were offered to several institutions or collectors. If one potential buyer declined to purchase an item, another might scoop it up. We knew that for some objects in our collection the only way to get the full picture of their provenance was to expand the search to other institutions. In 2015, we expanded our search for documentation to the archives of the University of Pennsylvania (now Penn) Museum of Archaeology and Anthropology. In 1908, George Heye struck a deal to place his growing North American ethnology and archaeology collections at this university’s museum in Philadelphia. There, the collections were cared for and exhibited in two galleries from 1909 until 1916, when Heye withdrew them to create the MAI. Due to these relationships, the Penn Museum archives hold documentation from this early period of Heye’s collecting. Surprisingly, correspondence in the Penn archives between Heye and George Byron Gordon, the university museum’s director, pointed to a new connection. In a letter to Gordon dated July 19, 1909, Heye wrote that he had in his possession “a British Columbia painted skin from Oldman.” This led to the discovery of an incredibly rich archival collection on the other side of the world. I recognized the name Oldman from MAI catalog records: William Ockleford Oldman (1879–1949) was a British dealer in ethnographic art and European weaponry. He sold to museums and collectors throughout Europe and the United States, including George Heye. The NMAI collections include hundreds of objects recorded as purchased from Oldman, but we had no record of a 1909 purchase. 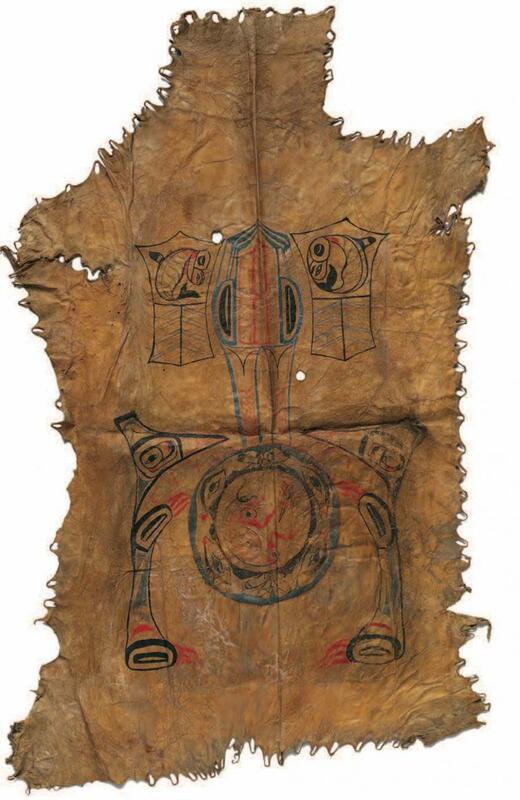 Searching our collections database, I found a painted skin from British Columbia acquired in 1909 but there was no source named: its catalog card simply indicated that it was a purchase. Digging deeper, I learned that Oldman was not only a dealer but also a collector. 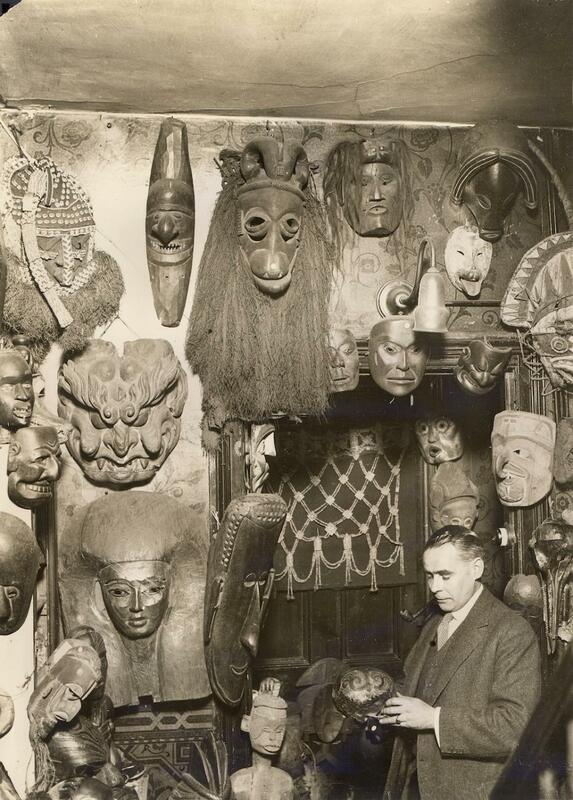 He sold his personal collection of Oceanic objects to the government of New Zealand in 1948. This collection, including his business records, is now part of the Museum of New Zealand Te Papa Tongarewa in Wellington. I contacted Te Papa’s archives and received word that they had several of Oldman’s sale registers as well as his collection ledgers and correspondence. One photo from Oldman’s ledger confirmed not only the sale of the painted skin in June 1909 to George Heye but other objects Heye had purchased at that time. Based on the descriptions in Oldman’s ledgers, I succeeded in identifying several other NMAI objects that were described simply as purchases on their catalog cards. As an added bonus, Oldman had recorded the date he had purchased the items and from whom. The painted skin that began this search was purchased by Oldman from the J.C. Stevens Auction on Feb. 16, 1909. Documentation at Te Papa confirmed the items’ association with Oldman but also provided starting points for research into his sources and the hands the objects had traveled through. Gaining a better sense of from whom Oldman bought also has the potential to improve our understanding of how American Indian objects made their way to Europe in the first place. The result will be a deeper, more detailed understanding of holdings like our painted skin from British Columbia. NMAI is collaborating with the Museum of New Zealand Te Papa Tongarewa to digitize the Oldman ledgers and make them accessible to the public through the Smithsonian Online Virtual Archive at sova.si.edu. Because the ledgers date from the early 20th century and are handwritten, NMAI has also begun a Smithsonian Transcription Center project and welcomes volunteers. For more information, go to transcription.si.edu. Maria Galban is collections documentation manager for the National Museum of the American Indian.